A woman with vague symptoms is admitted appropriately, cautiously and without panic to a top class medical facility in Brisbane for testing and observation. 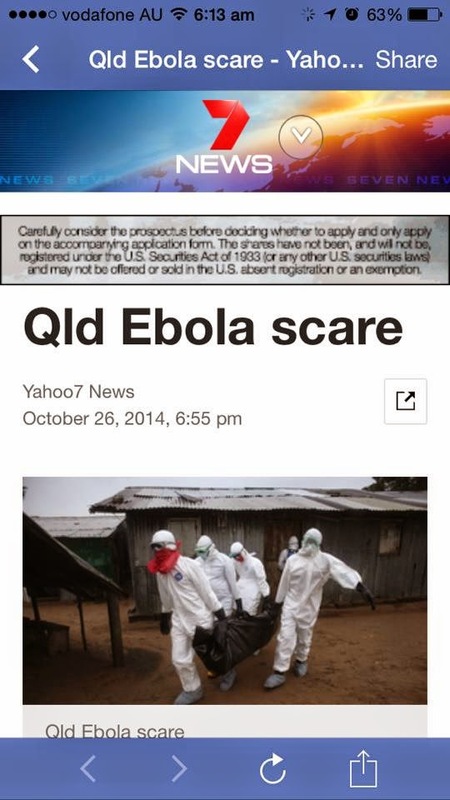 And what picture does Seven News use to illustrate the story online? A disturbing image of people in Hazmat gear dragging a body bag, with no caption to put it in context. How ironic that Seven's current series of medical reports by Dr Andrew Rochford is called "Healthy Truth", because the truth about Ebola is the last thing they seem interested in reporting. Ebola is less contagious than flu. It doesn't spread by air. Only those in direct contact with the secretions of someone with Ebola symptoms can catch it. It's way past time that Seven and other news organisations did what they are supposed to do... their role and duty in a civilized, modern society. Stop misleading and report the truth. Keep the community informed instead of scared. Give balanced, rational coverage and stop fuelling hateful, xenophobic and racist attitudes like the ones we see exhibited by the morons in the comments on Seven's website and social media pages. And if Dr Andrew Rochford wants to be seen seriously as a medical communicator and not just a novelty ("oh look, a real doctor doing current affairs"), he must take a leading role in this.